Deadlines Deadlines Deadlines. Cutting it close this time, but this post brings me to my self imposed minimum of 6 posts a month. Before jumping back into the trip pictures, something strange occurred today while working in the yard. It was time to deal with the trimming so I brought the trimmer out, gassed it up and reved it up. As soon as the engine fired a barn swallow flew up behind me and started hovering in the air. Actually, it was more like a bird backstroke because the birds body was actually vertical while the wings did a backward flap. Not phased in the least by me turning to look at him, I decided to play out the situation. As I was whacking down the weeds a moth flew up into the air. At that point it all became very apparent. The bird launched into action, chased that moth down and caught it. I was impressed, not only was he pretty agile, he (assuming a male at this point) was smart enough to associate my trimmer with dinner. This went on for about 15 minutes until he was either full or needed a rest. For the curious, I could care less about the insect. I draw the line there in favor of actual animals unlike PETA which apparently doesn’t know what the ‘A’ actually stands for based on their recent declaration against Obama killing a fly. With that out of the way, I’ll lead with this picture. Take a minute and just absorb the image…. Linda thinks I’m crazy, but it sure looks like a rock man with ummmm… well… let’s just say that is some hard rock. She vetoed my idea of merging it with one of the pictures of Old Faithful. 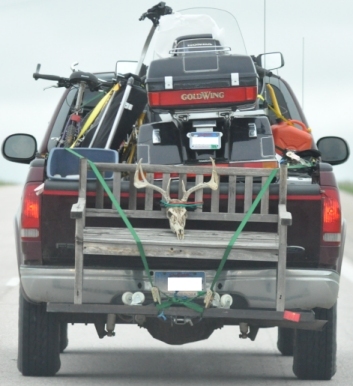 While in South Dakota, this truck passed us on the highway. All I could think of was the movie The Jerk when Steve Martin picks up the red chair and claims that is all he needs. I would think the paint would be getting scratched up pretty good, but I must admit, the skull was a nice touch. We also saw a number of odd statues in the oddest places. 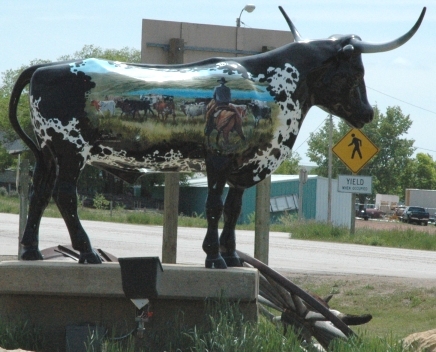 This painted bull was actually off the highway positioned off the road a little bit from a filling station we filled up at. It seemed like a waste since it was done quite well and the only people that were going to experience it were the few that were passing through and needed some gas…. with exception fo the locals of course, but why not share something this well done. Although to tie into the start of the post, it could use a little trimming. This picture came out too blurry and dark. It was getting ready to storm and we were in the car at the time we passed this bear outside a Wells Fargo. I couldn’t figure out what was painted on the belly as we passed and I still can’t figure it out. It looks almost like a black pot with a fire glow around it, but I can’t explain it. I guess the sign would have explained it all, but we were looking for a place to stay in Cody SD and did have the time to double back. We did however stop to check out an odd surroundings to a rest area at Greybull. As we got off the highway to go to this rest stop, we noticed a bunch of old planes sitting around the side and the back. Turns out there was an air museum next to it with some pretty interesting planes. They must have had 20 planes viewable from the rest area. The odd thing is there was no real indication from the highway that this museum actually existed there nor was it advertised as a benefit to drivers who were willing to take a break and rest a bit. Opportunity lost in my book. Lastly, the gift shop located at the Holiday Inn Express in Cody SD. There is not much interesting from the picture perspective, but rather the situation that occurred there. We ended up buying an item there as a gift for someone. Linda went to the checkout to pay with an older cashier. I can’t remember the exact amount of the total but it was like $12.17. Linda paid with a $20 and 17 cents. This was a baaaad move. The lady looked at the change and at the register a couple of times. She then says “I need to give the change back to you, it is easier on the system”. I was stunned for a moment until she admitted “and on me”. So the real problem was she could not figure it out which is little more explainable to me as opposed to the system. Linda took the change back, I held my thoughts and made a mental check to take a picture to remember. To be honest, the older cashiers usually have no problems with making change probably due to working money transactions without the fancy computers and registers. All I got for now. Ironically though, we pulled next to a restroom about 50 feet from where you pay to get into Yellowstone National Park from the East. When Linda came around to my side of the car she looked down and found 5 bucks just laying there. It probably fell out of a moose pocket!